About once a year I do an Air Show Scrapbook when we get the pleasure of watching our Air Force or Navy perform at a local Air Show. This year there were about 100,000 in attendance at the Joint Base Charleston, SC on April 9, 2011. 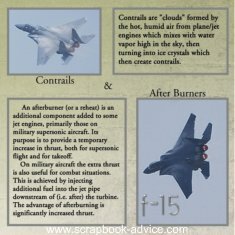 These two Air Show Scrapbook Layouts focus on the F-15 Flight Demonstration. It took me a lot of tries and a number of different cameras over the years to finally get an angle that would capture the afterburners. It was very humid that day and I also saw the Contrails from the wings of the F-15 and was able to capture that on film as well. For these layouts, I made the background very plan - a light gray - and simply matted the photos in a darker gray. 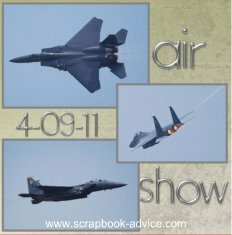 I used metallic lettering for the Air Show Title and Date and for the F-15 Caption. The journaling is informational about the Afterburners and Contrails, which is the title of the page on the right. One of the newest events or demonstrations that was put on this year, was the joint venture between the Japanese and Americans fliers called "Tora! Tora! Tora!" 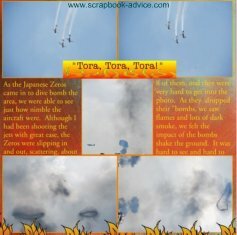 If you have not yet seen this show, click on either of the photos to go to the "Tora! Tora! Tora!" Home Page and check to see if there is a location near you. All in all it was a very stunning and informative demonstration! The demonstration is an effective way to teach, learn and avoid the mistakes of the past. For these layouts, I used a background paper with a muted pattern of fire and flames to represent the fire that came from the "bombing re-enactment". I put the photos of the Japanese Zeros at the top with the flames and smoke rings generated at the bottom of the page. Coming from the bottom of the page under the photos are flames. Journaling is done in a bright orange and tells about the many sights and sounds generated by the re-enactment, the wind, the shaking of the ground, the smoke and the difficulty in capturing the photos of the aircraft. 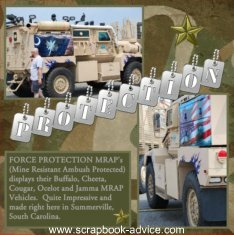 This static display put on by Force Protection, from right here in Summerville, SC shows off their MRAP Vehicles - Mine Resistant Ambush Protected. They had samples of their Buffalo, Cheta, Cougar, Ocelot and Jamma MRAP's. They were very impressive. For these layouts, I used a background paper of camoflauge. I put the photos of the on mattes that matched the lighter color of the green in the camo paper. 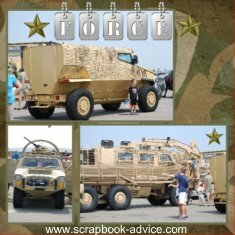 The Titles for these pages was done using Metallic Dog Tag Letters spelling out the "Force Protection". The journaling is done in black on another green that matched the camo background paper. For a list of Air Shows that are scheduled around the country, please check here for the Air Show Calendar. And if you are looking for some great tips to capture some special photos at the Air Show, check out this article by NYI Student Advisor Chris Corradino at Air Show Photography. Here are some more Air Show Photo tips from The Flying Kiwi. 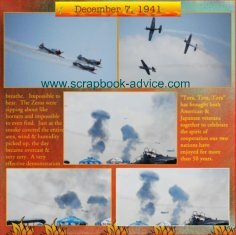 I hope you enjoyed this Air show scrapbook and have a few new ideas of your own to try. We should have some more soon. Let us know if you have any Scrapbook Layouts you would like to share with our readers.